We have been enjoying an extended stay in the country. A special time spent mainly cooking at home, exploring outdoors, and dunking in the pool. We have been in the rhythm of checking the garden each morning and harvesting what's there, with a promise to use at least one garden item in each meal. We went through waves of vegetables so fresh we never tired of them: snap peas, green beans, cucumbers, eggplant and tomatoes to name a few. The perimeter of of the garden has berry bushes planted last year that provide berries all summer long. First with black raspberries, then blueberries, then red and yellow raspberries - the latter being the sweetest of the lot. 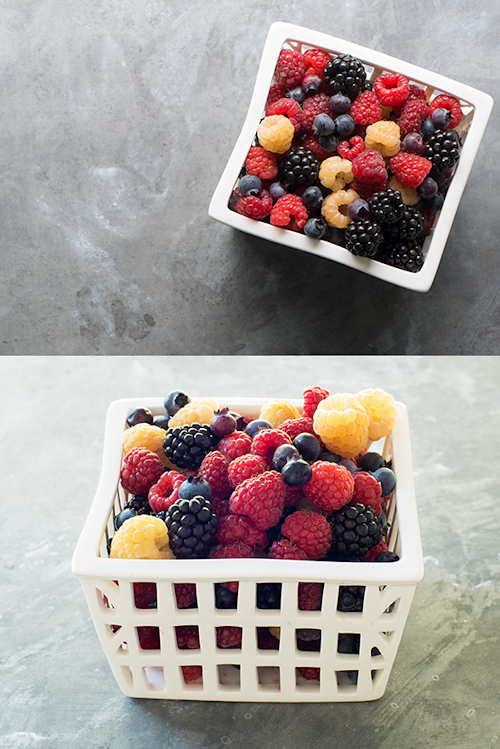 We get a generous handful of new berries each day, and it seems impossible to think of wasting a single one. My little one who loved blueberries as a baby, has now decided he's no longer interested in berries, with the exception of strawberries, which are a bit on again off again. I figured a popsicle might change his perspective? 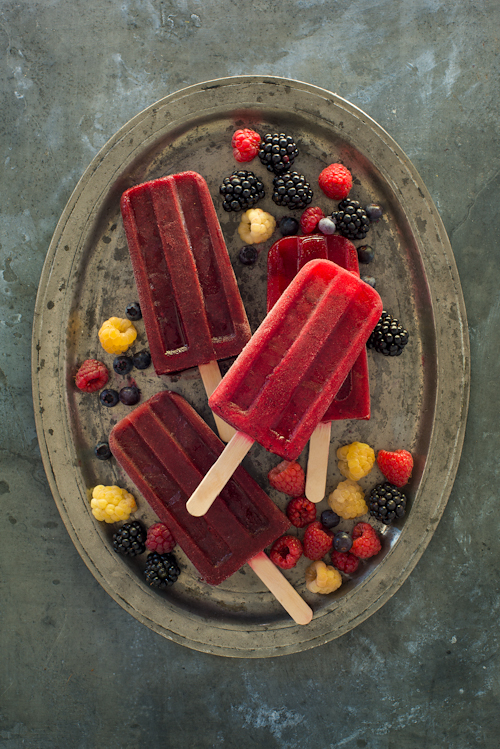 I started with mixed berry popsicles of local strawberries plus our blueberries and raspberries. They were so fresh and divine, but apparently not acceptable to him. He requested purple popsicles. I moved on to blackberry lime popsicles, a deep purple in color, that we made together (he operated the blender proudly), and apparently hit the spot after some coaxing. Later this week, having discovered a recipe for fudgesicles in this month's edition of Everyday Food, we made the creamy classic together. There was no encouragement needed to devour those. Combine ingredients in blender until berries are processed into fine pieces. Taste and adjust sweetness and acidity to taste (note that mixture will taste less sweet when frozen). Strain through a fine-mesh strainer to remove seeds and any remaining pieces of skin. Pour into moulds and freeze for at least six hours. To unmould, run moulds briefly under hot water until popsicles release.